A zoo within a neighborhood. Woodland Park Zoo has been an urban oasis for the community since 1899. Our collection of animals, commitment to sustainability and dedication to wildlife conservation make it a very special place for families to reconnect and recharge. 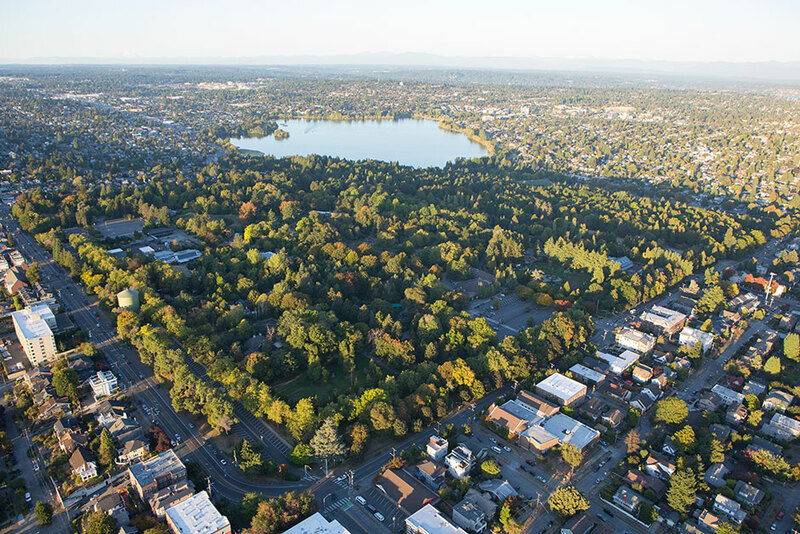 The zoo’s picturesque location on Phinney Ridge, along with continued support from our neighbors, truly sets us apart from other city assets. We value our relationship with the community and are committed to being a good neighbor. Please check back often to stay current on the zoo’s events, exhibits and projects, especially those of particular interest to the neighborhood. Register to receive special updates on zoo news and important neighborhood information including details on our annual Neighborhood Appreciation event. An aerial view of Seattle's Woodland Park Zoo with the surrounding Phinney Ridge neighborhood. Green Lake is at the top of the photo. The zoo was founded in 1899 when the property, originally an estate and residential development owned by Guy Phinney, was sold to the City of Seattle by his widow. For more information, visit our History section.